My ALL-TIME favorite comic cover is the cover to Doctor Strange # 169. EVERY time I see that Dan Adkins illustrated piece, it just sends me. I have other faves, but that one is my all-time A-#1, top-of-the-heap, pick. Other than that, I have a peculiar fondness for any cover that has that old silver-age-color-separation style covers where it looks like muted tones of an almost watercolor nature. Of course, I can't think of a single one now... but that Doc issue does also have that quality so it'll work as an example. This encapsules perfectly what the book was all about: sci-fi, bold, different, graphic and mature. Actually, Giffen's whole run had such amazing covers, so different and striking that it is painful to see whatever came afterwards. Yeah, that's a terrific cover, P. Dan Adkins was a wonderful artist...and he was a great match for Doctor Strange. That Giffen kid has talent, Ricardo. I think he's got a real future in this business! But, seriously, if you're a fan of Keith's art, you'll be happy to know that he's picking up the pencil again, for a few different projects, including an upcoming issue of our BOOSTER GOLD run. I, for one, can't wait. On the Marvel side, my favorite cover is probably WOS #32. If anyone thinks KLH is just a story about madness and death, I point them to that. This is kind of a cheat, because it wasn't originally a cover, but I love the image that made its way to LOST YEARS #0--Ben Reilly, slumped, defeated, caught in a torrential rain, desperately clinging to the identity he's lost one last time. Breaks my heart. ASM 246: Jonah Jameson decks Spider-Man. Yup, it's a dream sequence, but what a cover! And it's actually one of the best (but overlooked) issues of the time. GREEN LANTERN (VOL. 2) #49. That's the one where Hal Jordan embraces his insanity. The image of Hal grinning and showing off the rings he's stolen from his fallen comrades is striking, to say the least. As soon as I post this, I'm sure I'll think of others! The Zeck cover really is a classic, David. One that seems to get better with time. And I have to agree about that Ben Reilly image from JR, Jr., too (but I would, wouldn't I?). Speaking of Romita, Jr.—I never saw that ASM cover before, but you're right, it's a terrific image. Yeah, I could really go on and on about JR, Jr.'s cover work from that era. ASM 254's a good one, too, with the image of Spider-Man peering through the rain at a mystery villain, exclaiming, "NO! NOT YOU!" Better than the story, actually. If you ever find yourself so inclined, check out ASM 246. Basically, the entire issue is devoted to Spider-Man and his supporting cast daydreaming. Good stuff. Now that I think about it, this ish would probably work pretty well with "I'm Only Sleeping" blaring in the background. Now there's an idea, David: How about KRAVEN'S LAST HUNT...read while listening to "Tomorrow Never Knows"? Yeah, I think "Tomorrow Never Knows" would complement KRAVEN'S LAST HUNT pretty well. I'm actually working on part four of my upcoming Kaine-Kraven story right now, David. Maybe I should be listening to "TNK" while I write. On the flipside of that match-up, I suspect Kaine is rocking out to some SKYNRD. Kraven the Hunter and "Bungalow Bill"? That's very funny, David. It's just so very dramatic and dynamic, and everything Kirby was best at, in one awe-inspiring image. 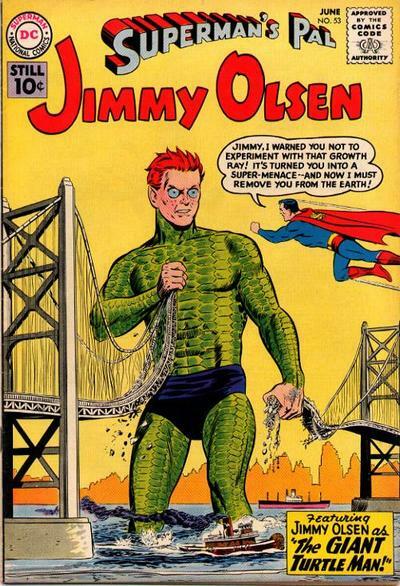 Can't think of an individual cover @ the moment, but I have to say that seeing that Jimmy Olsen cover makes me think of how awesome a new Jimmy Olsen series like that would be today. Show Jimmy getting into all kinds of wacky adventures, with or without Superman. Done as an all-ages title, with single-issue stories, it could be a great jumping-on point for new young readers. You know, I was going to point out the perspective on that JO cover is all wrong, at least as it relates to Superman and the bridge. But when you've got a giant turtle man on the cover, what's the point? There are soooo many great covers...first one that pops into my head is Adventure Comics #475 by Brian Bolland, with an inside story by...J.M. DeMatteis! That was a classic, old-fashioned cover...yet Bolland brought a modern sensibility to it. (Well, modern for 1980!) He's a sensational artist. One of the first stories he ever did for U.S. comics was a short science-fiction story I wrote called "Falling Down to Heaven." The art for that was extraordinary. I hardly even remember that THOR cover, James, but, seeing it again...well, it's fantastic. Marvel era Kirby really could do no wrong...and his covers were almost always mind-blowingly good. Re: Kirby. Totally agreed that Marvel era Kirby is the master of covers. I intentionally took him off the table in my listings because I never saw his comics fresh on the newsstand. But he totally nailed the balance between artistic genius and commercial sensibilities--you want to frame his covers AFTER you've read the STORY. Modern cover artists could stand to gain a lot by going back to the King. I don't know why, but these days covers are mostly generic poses that tell me NOTHING about what's inside or why I should care. Seems like comics companies are operating on the assumption that their readers are already invested in the story--which, when you're competing for my dollar, IS NOT THE CASE!! Take WEB OF SPIDER-MAN. It's been a good, and at times fantastic (re: ECHOES and NOBODY), title. But aside from the first issue, the covers have told me basically NOTHING about what to expect. When I picked up WOS 5 for the Reilly story, I found that I enjoyed the FVL lead a lot. But I wouldn't have known that from the cover, because it was just a generic Vulture shot. Nothing about that cover screamed "Buy me!" And if I hadn't realized WOS 5 featured a Reilly story, I certainly wouldn't have figured it out. At the very least, an "And also in this ish: Ben Reilly!" blurb would do in a pinch. I don't mean to be too critical, I just think that if a good cover can sell a weak story, then great stories ought to have sensational covers! More of a back-handed compliment than anything. WOS deserves no less. Anyway, all these covers are terrific, and interest me in the stories behind them. 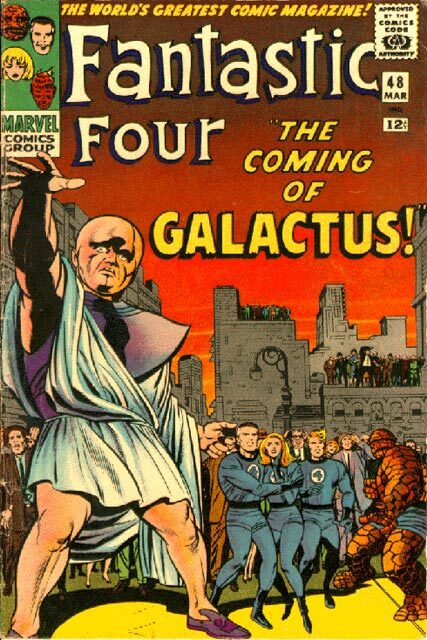 Could Kirby boil my story concept down into a single, sensational cover? If he couldn't boil it down, I might need to simplify. If he couldn't sensationalize it, I might want to spice things up! GREAT questions re: Kirby's ability to boil an idea down to a cover, David. Perhaps every mainstream comic book writer should ask those questions before hitting the keyboard. The thing I love about the FF cover I selected is that it is, in many ways, the opposite of what we identify with Kirby. This isn't some cosmic slugfest. It's essentially a portrait of silent anticipation. But, in that anticipation, we see the whole story. It continues to amaze me. I agree with you about the whole "portrait cover," thing. They can be very impactful sometimes...but when every cover is just a poster shot, with little or no connection to the story, it gets awfully boring awfully fast. I hadn't even thought about why that cover's so effective, but you're totally right. I recently discovered that when TALES OF SUSPENSE began featuring Iron Man, Lee and Kirby were still writing sci-fi backups. That discovery whetted my appetite to see what those original Lee/Kirby sci-fi collaborations were like. That cover seems to capture not only the story inside, but the whole TWILIGHT ZONE vibe fueled by post-nuclear fears. It's that dynamic tension between the Kennedy optimism and the Cold War/ Vietnam era terror that makes it work--there's a fine line, after all, between terror and awe. There's this fear, but also the sense that maybe the layers of the world we know are being peeled back and something better, something fantastic is about to come rushing to the surface. "Is this the end of the world or the beginning of a universe?" Absolutely. Now let your imagination go and write your own story to go along with the image. Spoiler alert: It's always "THE BEGINNING." I don't know why, but this one had my ten-year-old brain racing. I couldn't wait to find out what was going on in that story! That was one of those covers that just had me sold in one glance. No one does 'em better than Kevin Maguire. That JL cover is an absolute classic -- it's probably been riffed on more than any other cover I can think of -- and deservedly so. I suspect the idea for it came from Andy Helfer, our JUSTICE LEAGUE editor, but Kevin made it come alive. Looking at that, you just wanted to read about those guys. I'm not a comics expert. I read the ones my husband (Nicholas West) recommends and usually enjoy them. However, the most fantastically bizarre comic I have ever read, (and I'm sure Nick would agree), has an equally bizarre cover: Fletcher Hanks' I Shall Destroy All Planets! I flip through that when I'm having a bad day because it is SO absurd. Not familiar with I SHALL DESTROY ALL PLANETS!, Libby...but I'll be sure to scour the web for that cover. I'm a big fan of the fantastically bizarre. It's "I Shall Destroy All The Civilized Planets!" Kind of looks like a panel from a 1940's comic book, Nicholas. What's it about? It is a 1940's comic! It's a hyper-fascist superhero basically; starring "The Super Wizard Stardust." Stolen from wiki: Stardust is an alien from an unnamed planet (in some stories, a star), whose "vast knowledge of interplanetary science has made him the most remarkable man that ever lived." He arrives on Earth vowing to clean up crime, and uses the powers that his knowledge has given him to fight all evil-doers. It was incredibly bizarre and inventive. However, being the 1940's, it features such chapters as "Gyp's Clip" and "Slant Eyes" (yeesh). It's all public domain now, but Fantagraphics recently collected a couple of volumes. They are definitely worth a read! That's funny. Here I thought someone was aping a 1940's style. The book sounds like something I'd get a kick out of. Thanks for filling me in. As these comments had briefly drifted ever so slightly into the realm of "music to read (or create) comics by" - specifically, BEATLES transcendental/ psychedelic tracks - I offer forth this old post of mine - wherein I discuss the nature of "magic" in comics, Dr. Strange, comics writers who understand mysticism (JMD being one of the greatest)and "Within You - Without You" by George Harrison. Great piece on your blog, ~P~. And reading Doc Strange stories while listening to "Within You, Without You"? Genius. I'd also throw in "All Things Must Pass." In fact, there are a number of other Harrison numbers that are perfect for Strange reading. Great stuff, Jeff. I may have to pitch Marvel on a new Doc Strange story, just so I can use "I Me Mordo" as the title: it's a classic! Can't think of any which might apply to the Defenders yet, but gimme time..
You really made me laugh with this batch, Jeff. Thanks! Today's my birthday, and the notion that I've entertained one of my favorite writers is a terrific present! Or we could go the Lennon route with "Happiness is an Elf with a Warm Gun." I'm heading out for dinner now...but thanks for putting a smile on my face with this silliness. Hey. J.R. LeMar— I just found some lost comments here at Creation Point and yours was one of them. Sorry it's taken so long to post it! And, yes, a monthly JIMMY OLSEN wackfest would be fantastic. Great idea!